of work was to dredge the areas to a bottom elevation of -5.0. 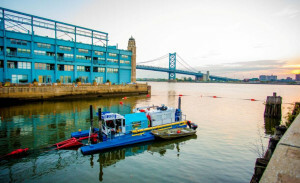 An Ellicott Series 360 SL, Swing Ladder Dredge and DredgePack software were used for the dredging operations. Pre and post dredge surveys were completed to ensure proper channel bottom elevations and to calculate the volume of material removed. The initial survey was performed to evaluate the existing conditions and determine the approximate quantity of material to be removed. Several surveys were performed during the dredging as required to determine the progress of the dredging operations and if any movement of the channel bottom material was noted. A post or final survey was completed at each site to verify the three marinas were completed in accordance to the scope of work. Hydro was able to complete the dredging by January 2016.